We’d love your help. Let us know what’s wrong with this preview of A Prisoner of Birth by Jeffrey Archer. International bestseller and master storyteller Jeffrey Archer is at the very top of his game in this story of fate and fortune, redemption and revenge. If Danny Cartwright had proposed to Beth Wilson the day before, or the day after, he would not have been arrested and charged with the murder of his best friend. But when the four prosecution witnesses are a barrister, a popular actor, an aristocrat, and the youngest partner in an established firm's history, who is going to believe his side of the story? However, Spencer Craig, Lawrence Davenport, Gerald Payne, and Toby Mortimer all underestimate Danny's determination to seek revenge, and Beth's relentless quest to pursue justice, which ends up with all four fighting for their lives. To ask other readers questions about A Prisoner of Birth, please sign up. Pascoe believes that Leach killed Nick and it was not a suicide. When he discusses this with the governor, he says he wants solid proof. Luckily his secretary brings in a sheet of lined prison paper to which the governor responds by saying “now this is what I call proof." What is this proof? Why wasn't this revealed later? This story held me prisoner for hours! It’s surprising that some authors/critics attempt to undermine Archer’s talent. His vocabulary is too simple, they say. Plot sequence is entirely too linear, they say. What they don’t understand is that he is foremost a STORYTELLER with the innate, almost intuitive, manner of weaving believable characters, relatable dialogue, and most importantly, outstanding plots. Someone once said that a brilliant mind is known by its ability to communicate a complicated subject matter in a simple manner and without losing the essence. This is what Archer does. Consistently. Through numerous number one bestsellers, and 270 million copies sold to date. This book is yet another example of his talent and well-honed craft. Hats off. Wow! I felt like a 13 year old reading the final installment of Harry Potter. Other than bathroom breaks and a quick dinner, I did not put this book down. Jeffrey Archer is a master with characters, twists and storys within storys. I am going to write a novel like this as soon as I can! Truly beatiful language, empowering scenery and ending. I especially loved that the plot was very neat, overly so - are there really that many lookalikes in reality, who cares? I loved this book and it covers evrything. The author instantly became my favourite, I definitely will read his other books. In an interview included in my edition of this book, James Archer (born 1940) said that this novel is a contemporary retelling of Alexander Dumas The Count of Monte Cristo. Since I have not read yet the said classic book, I checked its synopsis in Wikipedia. It seems that Archer did a good job by using the plot but making it current by putting his personal touch on it. Among the different literary genres, I must admit that suspense thriller and romance are my least favorites. I love reading read In an interview included in my edition of this book, James Archer (born 1940) said that this novel is a contemporary retelling of Alexander Dumas The Count of Monte Cristo. Since I have not read yet the said classic book, I checked its synopsis in Wikipedia. It seems that Archer did a good job by using the plot but making it current by putting his personal touch on it. Among the different literary genres, I must admit that suspense thriller and romance are my least favorites. I love reading read fiction, classics, memoirs and children's. Sometimes, I also pick up books belonging to sci-fi, young adult, travel, and history but I rarely read suspense thriller and romance. I think the main reason is that these two follow certain formulas and the author should only inject the plot, characters, milieu, conflicts, climax, denouement and conclusion. One cannot deviate from the formula since readers who go to the bookstore know what they want. As examples, in suspense thriller, the issue must be resolved in the end while in romance, the boy and the girl should end up together. In other words, they should have T"happy" endings. In fact, among the 500 novels I've read, I've only read: Dan Brown's The Da Vinci Code, Angels and Demons and The Lost Symbol;Ken Folett's The Eye of the Needle, Hornet's Nest and Whiteout; John Le Carre's The Spy Who Came in From Cold; Ian Fleming's Casino Royale; Vince Flynn's Protect and Defend; John Grisham's The Appeal and Robert Ludlum's The Ambler Warning. For me, among all of those, A Prisoner of Birth is one of the best, maybe comparable to those works by Le Carre and Fleming. Archer is definitely better than Flynn, Ludlum and Grisham. Archer is said to be the British equivalent of the American Grisham. I do not agree with this. For me, Archer is better than Grisham. Danny Cartwright is an illiterate man who is about to get married to Beth Wilson. However, on the night of Danny's proposal to Beth, a drunk military man Spencer Craig kills Beth's brother Bernie Wilson who is with the couple on that night. Spencer is with his 3 other friends who are all influential and the court gives weight on their testimonies in favor of Spencer. So even if Danny is innocent, the jury gives him a guilty verdict: imprisonment of 22 years. In prison, Danny meets his lookalike Nicholas Moncrieff who is an ex-soldier and an only scion of a rich businessman. Nicholas taught Danny on how to read, write and act like him. However, Nicholas is killed by a fellow prisoner and this gives opportunity for Danny to pretend to be Nicholas and see the outside world as a free man earlier than the completion of his sentence. What follows is how he takes revenge over the 4 men who has wronged him and his fiancee. Very engaging, detailed court scenes. I have not been into an actual court hearing so I appreciated how Archer depicted in details the court drama. The prison scenes are likewise very realistic and in the same interview, Archer said that he based everything on his own experienced. Archer was also imprisoned in 2001-2003 for perjury and perverting the course of justice. (Source: Wikipedia) My only question are there still illiterate people in London?. I mean, in the Philippines, which is a third-world country, illiterates seem to be too few that in my 46 years in the country, I only met one no-read, no-write person so far. As a friend very rightly put it…’A Prisoner of Birth’ has all the makings of a Bollywood Masala Movie. Danny Cartwright, a humble East-End mechanic has just proposed to his childhood sweet heart Beth. He decides to celebrate by treating his fiancée and best-friend Bernie Wilson (who also happens to be Beth’s brother) at an upmarket bar ‘The Dunlop Arms’. Also present at the bar, are a drunken party of four men, who started passing lewd comments at Beth and raise Bernie’s ire. Despite Danny’s prot As a friend very rightly put it…’A Prisoner of Birth’ has all the makings of a Bollywood Masala Movie. Danny Cartwright, a humble East-End mechanic has just proposed to his childhood sweet heart Beth. He decides to celebrate by treating his fiancée and best-friend Bernie Wilson (who also happens to be Beth’s brother) at an upmarket bar ‘The Dunlop Arms’. Also present at the bar, are a drunken party of four men, who started passing lewd comments at Beth and raise Bernie’s ire. Despite Danny’s protests, the two parties decide to take the fight out into a back-alley..and what follows is something that changes Danny’s life forever. Danny is charged with the murder of Bernie……a crime he never committed. Despite the best efforts of his able lawyer, the young and relatively untried Alex Redmayne ……Danny is sentenced to twenty-two years at the maximum-security Belmarsh Prison. After all who would take the word of a grubby mechanic over a stalwart quartet of an upcoming barrister, a leading actor, a member of the aristocrat and the youngest partner of an established firm? Danny’s long sentence is made bearable due to his two cell mates: Sir Nicholas Moncrieff, who looks and behaves more like an officer than an inmate. And running-more-true-to-form, the rough and rugged, heavily-built Big Al. Nicholas bears a startling resemblance to Danny and herein lies the crux. When Nick is accidentally murdered, just a few weeks before his release…Danny (with careful mechanisations by Big Al) walks out a free man…as Nicholas Moncrieff. "Act like Nick.Think like Danny." Constantly keeping this in mind……Danny launches into an intricate and well-planned revenge. A page-turner with certain implausible points. Look-alike Nicholas Moncrieff seemed to be aware from the beginning that his identity was for the sole-purpose of being used to prove Danny’s innocence. He trained him in all the niceties and etiquettes which a Moncrieff should exhibit in genteel society. He educated Danny and even conveniently maintained well-transcribed diaries which proved to be valuable evidence in the later trials. A post-Belmarsh Danny appears to lead a charmed life. All the people he hopes to have on his side, unflinchingly accept that he is indeed Sir Nicholas Moncrieff, never once cross-checking the fact. While Danny Cartwright is a likeable hero, his transformation from the wronged East-Ender to a polished and articulate businessman is a little too good to be true. At the end of the day, I enjoyed the cast of supporting characters: Big Al, Alex Redmayne’s father; rt. Hon. Sir Matthew Redmayne KCMG QC, who handles Danny’s case in the end…and ofcourse, the wise Scottish solicitor Mr.Fraser Munro. I particularly liked the miniscule speech Mr.Munro gives towards the end of his testimony: “I have discovered with advancing years that few things are entirely black or white, but more often different shades of grey. I can best sum it up, My Lord, by saying that it was an honour to have served Sir Nicholas Moncrieff and it has been a privilege to work with Mr.Cartwright. They are both oaks, even if they were planted in different forests. But then, m’lord, we all suffer in our different ways from being prisoners of birth”. This is one of the most enjoyable audiobooks I've listened to all year. I suppose it reminded me of this author's Clifton Chronicles which I also love on audio. Similarities would be the theme of a poor young man trying to get out from under the thumb(s) of the rich. Same guy going to prison for something he didn't do, leaving behind his fiancé, at one point refusing to communicate with her again. Now, the more I think about it, the more similarities I see; yet this story stands on its own two f This is one of the most enjoyable audiobooks I've listened to all year. I suppose it reminded me of this author's Clifton Chronicles which I also love on audio. Similarities would be the theme of a poor young man trying to get out from under the thumb(s) of the rich. Same guy going to prison for something he didn't do, leaving behind his fiancé, at one point refusing to communicate with her again. Now, the more I think about it, the more similarities I see; yet this story stands on its own two feet. Even if you've never read Archer before, this should be an enjoyable read. Lots of legal twists (the best one I did see coming) and then I do like books that focus on revenge, sweet revenge. This is the most well written book to which I've given a 1. It's also the first one star rating I've given to Jeffrey Archer. If you searched the words 'go to' in my dictionary, you'll find a picture of Archer. That's no longer true. More than the first half of the book had some merit, but it was only about build up, promise, and expectation. All three undercut, broken, and betrayed, respectively. If a restaurant makes you wait for so long that you're not faint of hunger but bored, impatient, a This is the most well written book to which I've given a 1. It's also the first one star rating I've given to Jeffrey Archer. If you searched the words 'go to' in my dictionary, you'll find a picture of Archer. That's no longer true. More than the first half of the book had some merit, but it was only about build up, promise, and expectation. All three undercut, broken, and betrayed, respectively. If a restaurant makes you wait for so long that you're not faint of hunger but bored, impatient, and surly, do you feel satisfied in any way when a bunch of tripe is served to you? Of course(no pun intended) not; that is not sweetening the deal. .كل يوم نكتشف ان عالم الكتب كبير جدا ، حتي لو كنت تعتقد انه عندك فكرة عن كاتب الأروع ..وانه مش حايجي حد ممكن ينافس حد في مكان ثاني "تبقي عبيط واقرع وزمباوي كمان "
هذه القصة داني كارترايت الذي كان في المكان الخطآ والوقت الخطآ ونتهي بيه المطاف في السجن لجريمة لم يرتكبها ، كما تستمر القصة حتي يصبح صديقا لزملائه في الزنزانته الذين يعتقدون انه فعلا برئ ، بعد ان قتل احد زملائه في الزنزانة ، .كل يوم نكتشف ان عالم الكتب كبير جدا ، حتي لو كنت تعتقد انه عندك فكرة عن كاتب الأروع ..وانه مش حايجي حد ممكن ينافس حد في مكان ثاني "تبقي عبيط واقرع وزمباوي كمان "
هذه القصة داني كارترايت الذي كان في المكان الخطآ والوقت الخطآ ونتهي بيه المطاف في السجن لجريمة لم يرتكبها ، كما تستمر القصة حتي يصبح صديقا لزملائه في الزنزانته الذين يعتقدون انه فعلا برئ ، بعد ان قتل احد زملائه في الزنزانة ، انتهي الامر ان يستغل داني تلك الحادثة ويخرج من السجن بشخصية صديقه المقتول "نيك" واكماله لخطة قضاء علي القتلي الذين كان سبب في دخوله السجن وقتل اعز اصدقائه . جيفري ارتشر ، كاتب مدهش ، لايرتبط اسم جيفري مع الملل ابدا …"شئ شئ ماتفهم شئ "
My father lent me this book, and I hadn’t even realised Jeffrey Archer was writing again. I previously read his Kane & Abel series which were really good, but that was quite a long time ago, and I struggle to remember things that far back! Both my parents had read this, and both told me it was essentially unputdownable. My mother read it in both condensed and then full length format. I was expecting great things. I wasn’t disappointed. It really is a page turner, and yet at the same time there My father lent me this book, and I hadn’t even realised Jeffrey Archer was writing again. I previously read his Kane & Abel series which were really good, but that was quite a long time ago, and I struggle to remember things that far back! It really is a page turner, and yet at the same time there is so much detail that does nothing other than get you right into the heart of the book. The descriptions of life in prison are incredible, and clearly taken from his real life experience. Apparently this book is a reworking of the classic Count of Monte Cristo, which I am only vaguely aware of. I will have to give that one a go. 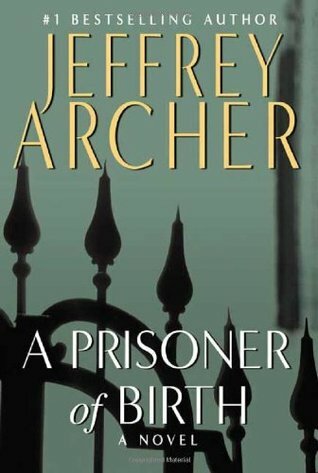 'A Prisoner Of Birth' by Jeffrey Archer is a modern retelling of the classic 'The Count Of Monte Christo' . The book follows story of a man who is wrongly convicted and now willing to extract revenge . Sadly I have to say that I found this book the weakest among the books I read by Archer . It seemed that Jeffrey Archer ran out of ideas while writing this novel ( A look alike prisoner , seriously ) . Many of the incedents in the novel are needlessly put and these incedentes slows down the pace o 'A Prisoner Of Birth' by Jeffrey Archer is a modern retelling of the classic 'The Count Of Monte Christo' . The book follows story of a man who is wrongly convicted and now willing to extract revenge . Sadly I have to say that I found this book the weakest among the books I read by Archer . It seemed that Jeffrey Archer ran out of ideas while writing this novel ( A look alike prisoner , seriously ) . Many of the incedents in the novel are needlessly put and these incedentes slows down the pace of the story . This was the slowest moving story by Archer I have ever read . The book is divided into five parts and in these parts almost every chapter has many weakly built characters and many loopholes . The one thing that I liked about Jeffrey Archer was stout character building but this novel is full of lame characters . Even the character of protagonist was not well built . All other characters were appearing over long intervals . Overall A Weak Book . A (loosely based) modern day retelling of the Count of Monte Cristo. This story was fun but I didn't think it was particularly well written and the story was too long. Another solid story. Sterotypical characters, clichés - despite the main character being told not to use them - and no real depth to anyone. But having said all that, I still read 500 pages and enjoyed it, so he must be doing something right. And now my Archer readathon comes to a close for the time being. Un best-seller del montón en el que no he encontrado ningún giro inesperado y no me refiero a que sean giros “malos”, es que son inexistentes. La trama principal del libro recuerda al argumento de un conocido clásico, el desencadenante y lo poco que puede llegar a considerarse sorprendente es casi seguro que ya lo has leído o visto en algún otro libro del género (o incluso película) si estás familiarizado con este tipo de novelas, no hay nada medianamente original. El estilo del autor es a veces Un best-seller del montón en el que no he encontrado ningún giro inesperado y no me refiero a que sean giros “malos”, es que son inexistentes. La trama principal del libro recuerda al argumento de un conocido clásico, el desencadenante y lo poco que puede llegar a considerarse sorprendente es casi seguro que ya lo has leído o visto en algún otro libro del género (o incluso película) si estás familiarizado con este tipo de novelas, no hay nada medianamente original. El estilo del autor es a veces algo simplón y el desarrollo de la trama da la sensación de estar muy guionizado, parece una historia de manual, con una estructura muy similar a otras tantas. No quiero decir con esto que no me gusten los best-seller (de hecho me encanta Dan Brown y disfruto mucho leyendo sus libros, aunque repita el mismo patrón en sus historias) pero es que me ha parecido todo tan preparado que queda muy forzado y en ocasiones poco creíble. No es que considere la lectura de El impostor una pérdida total de tiempo, puede llegar a resultar entretenido pero se acerca más a una película de domingo por la tarde, fácilmente olvidable, que a un libro que vaya a recordar de aquí a un tiempo. No entiendo la puntuación tan alta que tiene. It is a great book with absolutely no place for errors. A plot that makes you go 'ooh!' and 'aah!' A must read book for those who prefer crime-mystery novels and for the people out there who think it's boring to read about the court proceedings, trust me this book will make you want to learn the law. Alex Redmayne was my favourite side character because he is a lawyer and I have always had a liking for lawyers who are smart, handsome and prefer to do anything to help prevail justice Read on blog!! Alex Redmayne was my favourite side character because he is a lawyer and I have always had a liking for lawyers who are smart, handsome and prefer to do anything to help prevail justice over wrong. I rate it a 4.7 for the most mind boggling ending ever. Well its hard to meet the readers' expectations if your first few books are "Not a Penny More, Not a Penny Less", "Kane and Abel" & "As the Crow Flies". I felt that though the plot is not something that would make one say ... wow! now that's a new one. What I liked most is the pace at which the story runs. Probably that is why it Well its hard to meet the readers' expectations if your first few books are "Not a Penny More, Not a Penny Less", "Kane and Abel" & "As the Crow Flies". What I liked most is the pace at which the story runs. Probably that is why it is still readable though the plot and the climax are more or less on par (or below!) expectation from a master story teller like Jeffrey Archer. The best sub plot of the novel, for me, was the one concerning JAPANESE KNOTWEED. I read the full series of the Clifton Chronicles earlier this year and fell in love with Jeffrey Archer. I wish he would come out with another series like that because I loved it so much! My friend told me about Prisoner of Birth and how good it was. I watched a You tube video with Jeffrey Archer talking about his favorite books. He said that The Count of Monte Cristo was one of his all-time favorites and that he based his book, Prisoner of Birth on that story. That closed me! Having just finish I read the full series of the Clifton Chronicles earlier this year and fell in love with Jeffrey Archer. I wish he would come out with another series like that because I loved it so much! Having just finished the story a few moments ago I can say it's well worth reading! It's got some great court room drama scenes that keep you on the edge wondering which way things will go. It's a fantastic story about love, friendship, justice, etc. This was such a well written suspense/thriller . It's weaned me off my fantasy series books; it was such a good read. The plot and characters were so well developed. It had so many twists and turns. It was a little predictable in that it's a modern day version of The Count of Monte Cristo , but it was done in such an interesting way I didn't mind. And it's even better than the original classic, if that's possible. I don't say that lightly at all because I'm the type that believes the original This was such a well written suspense/thriller . It's weaned me off my fantasy series books; it was such a good read. I don't say that lightly at all because I'm the type that believes the original classics are hard to compete with. There were so many ups and downs in this novel. I got swept up in the emotions of the characters and actually got so upset when things weren't going well for the protagonist, Danny Cartwright, I had to take a break; which didn't last long. I can't wait to start another one of Jeffrey Archer's masterpieces. I thought his modern version of Cain and Abel was good, but this takes it to another level. He is not recognized enough for how smart, modern, humorous, and witty his writing is. It's been a long time since I've been able to say "Wow! That was SUCH a good book!" Thank you Jeffrey Archer. Chapeau. They are both oaks, even if they were planted in different forests. But then, m’lord, we all suffer in our different ways from being prisoners of birth. Jeffry Archer has done it again. He has written a sensational legal thriller that I couldn’t put down. I carried my Kindle every where I went even if I only could read a couple of pages at a time. I lost a lot of sleep because this gripping novel would not let go of me. The fast paced story takes place mainly in London, England, Scotland and with They are both oaks, even if they were planted in different forests. But then, m’lord, we all suffer in our different ways from being prisoners of birth. Jeffry Archer has done it again. He has written a sensational legal thriller that I couldn’t put down. I carried my Kindle every where I went even if I only could read a couple of pages at a time. I lost a lot of sleep because this gripping novel would not let go of me. The fast paced story takes place mainly in London, England, Scotland and with a dash of Switzerland. Archer wrote this clever and accurate story based on his real life in the courts and his four year prison sentence. Have I got you interested yet? Well, read on because it gets better and better. Beth said yes when Danny asked her to marry him. Danny calls Bernie, his best friend who is also Beth's brother, to meet at a wine bar to celebrate. As they were leaving, three drunk men at the bar started yelling filthy comments at Beth. They leave by the back door and suddenly one of the drunk men shows up, and the other two stand blocking the door. Suddenly Beth’s brother has been stabbed to death and Danny ends up with the knife and a stab wound in his leg. Danny goes to prison for twenty two years for a crime he did not commit. Danny Cartwright just proposed to Beth Wilson, his pregnant girlfriend, and life seemed so perfect. Suddenly though he finds himself arrested and charged for a murder he did not commit. When four well-respected witnesses testify against him, one of whom is actually guilty, he is sentenced to twenty-two years in prison. The four think that they have gotten away with it, but they underestimated Danny and Beth’s determination and ability to get their revenge. Not an Archer fan I was happy to find one of his books that I could enjoy. A Prisoner of Birth was a fairly good book. The plot was very interesting and intriguing. I did find that a couple of parts were a little bit farfetched, but still enjoyable. Danny was a deep and complex character, but was the only character I felt was developed for the reader. Some sections were slow, but I found that if you pushed past them you found out important details. I liked the European setting that was explored as it was not the parts of London books and movies often focus on. I recommend A Prisoner of Birth to anyone looking for a good drama and any Archer fans. A modern parallel to, The Count of Monte Cristo, done in a much shorter timeline. Jeffrey Archer did a great job of creating a story line that was interesting and characters that were compelling. I enjoyed the writing and the drama very much, it was suspenseful even though predictable. If you have read, The Count of Monte Cristo, this book has enough creative twists to keep it engrossing, if not, your going to love every oscillating turn. Another master piece by master story teller! The issue of the conflict between the British working class and nobility was addressed and I found that part interesting. "REVENGE IS A dish best served cold. " "I'm innocent," he repeated whenever anyone asked, to which the prison staff and his fellow inmates inevitably responded, "That's what they all say." While I liked the two other Jeffrey Archer books more than this one, it was still a decent read and it kept my attention. It may be that Jeffrey Archer fabricates details about himself, but when it comes to writing a thriller, he is a master. This is one of the best books I read recently. It Described in detail - sometimes to exaggeration (but it is unforgivable). This book is not tiring, it's rhythmic and tense, causes sink into the plot of the book and forget reality, and time passes unnoticed. Oh, yea! And There is a hero in the book who you fall in love with immediately. He is wise, considerate, determined and b It may be that Jeffrey Archer fabricates details about himself, but when it comes to writing a thriller, he is a master. Oh, yea! And There is a hero in the book who you fall in love with immediately. He is wise, considerate, determined and beautiful. On the last page, there is a surprise that leaves you thinking about the book all over again. Very nice. Okay, so after reading this book, I googled it and I found out that this was a contemporary retelling of Alexander Dumas' THE COUNT OF MONTE CRISTO. But since I never read the classic book, I checked out its summary in Wikipedia. I really felt that Archer did a great job by using the plot for his retelling but making it more modern by putting his own personal touch on it. It had mind-blowingly beautiful language, totally authorizing scenes and the ending was too good. I personally felt that the plot was very orderly and this book filled my head with questions like "Can there be soooo many lookalikes in this real world??" I loved this book and I will definitely read Archer's other books as well. Having read most of Jeffrey Archer’s work, I would rank this novel among his top-tier. That’s pretty good considering he is the author of As the Crow Flies and Kane and Abel, both among my all-time favorite novels. As others have said, (and in fact, the author himself), this novel is a loose re-imagining of Alexandre Dumas’ The Count of Monte Cristo, brought forward into modern day England. Novels of false imprisonment and subsequent revenge on the conspirators are always compared to Dumas’ mast Having read most of Jeffrey Archer’s work, I would rank this novel among his top-tier. That’s pretty good considering he is the author of As the Crow Flies and Kane and Abel, both among my all-time favorite novels. As others have said, (and in fact, the author himself), this novel is a loose re-imagining of Alexandre Dumas’ The Count of Monte Cristo, brought forward into modern day England. Novels of false imprisonment and subsequent revenge on the conspirators are always compared to Dumas’ masterpiece but this time, the novel stands fully on its own and is quite an enjoyable read. Much like Dumas’ protagonist, Edmond Dantes, Danny Cartwright is a working class man engaged to be married but arrested for a murder he did not commit. Most of the first third of the novel is devoted to his time in jail as he works towards winning his parole hearing and it is great fun to watch him learn the ropes from his two cell mates who would become instrumental in his eventual escape, revenge, and redemption. This is a fairly lengthy book and there are a lot of courtroom scenes which in a lesser author’s hands could become dull and repetitive. But the story and the characters have been so well drawn and the complex revenge plot so well constructed that those scenes serve to enhance the tension and drew me to the edge of my seat. It helped that Danny’s escape and revenge scheme was not perfect and was not saved by simple good luck but rather drew on the relationships he was able to build with those around him. Another nice one from Jeffrey Archer, a controversial figure in his own right, but one who has lived a life much like a character from one of his own books. Perhaps his own legal entanglements, courtroom appearances, and prison time has led to such powerful storytelling. Sometimes he hits and sometimes he misses but he remains one of my go-to authors. I finally decided to give four stars only because the justice and the fairness play such an important part of the novel. The legal discourse is superb, and the presentation of the life in prison seems plausible, and most importantly, it is a novel with a very significant literary reminiscence. It is definitely a book written by a Conservative, and as a liberal, you constantly pick up the clues and the messages that go against your convictions. But (I hate the conjunction at the beginning of the I finally decided to give four stars only because the justice and the fairness play such an important part of the novel. The legal discourse is superb, and the presentation of the life in prison seems plausible, and most importantly, it is a novel with a very significant literary reminiscence. It is definitely a book written by a Conservative, and as a liberal, you constantly pick up the clues and the messages that go against your convictions. But (I hate the conjunction at the beginning of the sentence:-))it is also a book written by a British conservative, and it is a sober relief to read about those ideas, especially if you are sick and tired of the neo-Con bigots across the Atlantic ocean. Kalau dilihat sekilas, A Prisoner of Birth, terlihat mengintimidasi dan membosankan. Tone cover yang suram, halaman buku yang tebal, dan topik hukum yang terdengar tidak menarik merupakan salah satu sebabnya. Tapi, sewaktu saya mulai membaca halaman pertama buku ini, saya sadar kalau ternyata buku ini luar biasa seru dan menarik. A modern "Count of Monte Cristo" (that was Jeffrey Archer's goal) and just as enjoyable! The book is not a simplistic presentation, but has enough reversal of fortunes to keep you on the edge of your seat, but the author said in an interview that he wanted the punishment to be appropriate to the crime. British courtroom scenes were extremely revealing -- you get to see the art of arguing a case in front of a British jury as well as learn about British prisons and Swiss bankers. The audiobook was A modern "Count of Monte Cristo" (that was Jeffrey Archer's goal) and just as enjoyable! The book is not a simplistic presentation, but has enough reversal of fortunes to keep you on the edge of your seat, but the author said in an interview that he wanted the punishment to be appropriate to the crime. British courtroom scenes were extremely revealing -- you get to see the art of arguing a case in front of a British jury as well as learn about British prisons and Swiss bankers.